In July 1945 (although some accounts say 1944), a German immigrant to Mexico, Waldemar Julsrud (1875/6-1952), a hardware merchant, discovered a number of clay figurines at the foot of El Toro Mountain on the outskirts of Acámbaro (Guanajuato, Mexico). Charles Hapgood (1904-1982), the historian of science from Keene College (New Hampshire, USA) who first made the impossible claims about the Piri Re’is map, also promoted claims that the figurines are genuinely ancient artefacts showing extinct animals, including dinosaurs. On the other hand, he was troubled by the near-perfect condition of what are often very delicate objects and the complete absence of any sort of patination that might have developed during centuries (or even millennia) of burial. It has been claimed that radiocarbon dates from organic materials on their surfaces are around 6,500 years old, based on three samples: sample 1 has a date of 3590±100 bp (I-3842), sample 2 of 6480±170 bp (I-4015) and sample 3 of 3060±120 bp (I-4031). It has been suggested that many, if not all of them, are modern souvenirs made for the tourist industry. Even if they are genuine, there is debate about what they depict. None of the published examples really resembles any known dinosaur. Instead, it has been suggested that they are stylised representations of living reptiles of the region or are composite fantastical monsters. Excavation of the objects was observed by a trained archaeologist, Charles di Peso, who found that they were only retrieved from hollows in middens with loose black soil quite unlike the rest of the middens. He also recognised that their lack of patination and surface damage was quite unlike that of other materials recovered from the same middens; moreover, they were recovered whole, while other objects were broken. 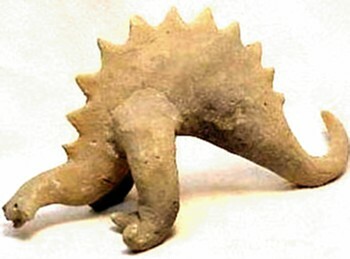 There is little doubt that the figurines are of recent date; thermoluminescent tests would be sufficient to establish their approximate date of manufacture and although dating was attempted in 1972 by Froelich Ramey of the Pennsylvania Museum, who obtained results suggesting that they were around 4500 years old. Subsequent tests in 1978 were unable to replicate these dates; indeed, they were unable to obtain any dates from the figurines, showing that they are of very recent manufacture. This does not prevent fringe writers from complaining that archaeologists have dismissed them as fakes without taking the trouble to examine them. For another deconstruction of the figurines, see this site [NB The original site has been down since October 2012 and the link takes you to a cached version of the page from the Internet Archive Wayback Machine dated 8 September 2012]. I would have to agree, these are fakes. But who the heck made 32,000 of ’em? Presumably a group of local people with time on their hands hoping to make money from wealthy tourists. in 1944, the most people in mexico even had a radio, or even know about dinossaurs existenci, i really don´t believe in this hypotesis that this rude people do this, with many creative. I think that you are underestimating the inventiveness of the average Mexican in 1944; remember, too, that the first figurines were “discovered” by a German immigrant. Sorry brother but your explanation stretches credulity. Are you seriously suggesting that some crooked Mexicans decided to educate themselves to the point where they could depict such a large variety of dinosaurs, then somehow these dirty cheating Mexicans, managed to gather up huge amounts of wood for fires which would have to be noticeable to some one anyone! Just so they could burry them in the ground, so some one might accidently dig them up? How do they make money from the grave again? You really are slandering these people when you so easily use them as an excuse to pull the cover over your own eyes, because your paradigm has been threatened by some extremely powerful pieces of ancient art? There were three separate samples sent to independent labs for carbon dating. The results all came back to one thousand plus – to over two thousand years old. Then a curious thing happened – all these labs found out what the source material came from, and all of a sudden, “oh, we forgot to twirl around three times with the samples in our hands, then we also forgot that we aren’t very good at this, and the dates are all bull anyway, so we made a mistake and those dates we came to, well, they must be wrong because everyone knows Darwin is the real infallible god, and I will keep my faith. Brother, you are not fooling anyone. I seriously doubt you believe your own explanation. There are depictions of dinosaurs carved into old Cambodian temples deep in the forest, which are over a thousand years old! There are other similar depictions of dinosaurs carved into granite in an English Cathedral. What you in effect are saying is Mexicans in 1944 were scam artists. That is truly ignorant, slanderous and prejudice remark, and you really need to apologize to the Mexican people. There are thousands of stories from all over the world depicting “dragons” What’s that all about? Just a fluke, like evolution, and it just so happened that all these various civilizations started writing about “dragons” at the same time? Read some of these stories brother. They ring as true descriptions, and not just fairy tales. Dinosaurs carved in granite in an English cathedral? Have you even thought about how daft that assertion is? English cathedrals have all been built within the last thousand years: are you seriously suggesting that there were dinosaurs wandering the open fields of medieval England? If so, why did no-one record their existence (other than in these alleged carvings)? Where are the documents that refer to them? Where are the depictions in manuscripts? Where are the (unfossilised) bones? If you think that my remark about “the inventiveness of the average Mexican in 1944” is a “truly ignorant, slanderous and prejudice remark”, then you obviously haven’t read the comment I was responding to. Either that, or you’re engaging int he logical fallacies og tu quoque and poisoning the well. You wouldn’t be doing that, would you? That’s scarcely a reply! However, the page is interesting, as it shows that the writer has not got the faintest idea about medieval iconography. We are dealing with an object that’s not from some remote, pre-literate past, but from medieval England. Is the writer seriously proposing that medieval brass makers knew about dinosaurs? That they were wandering the countryside of medieval England, alongside aardvarks? If so, where is the evidence? Where are the bones? Where are the written descriptions? Where are the legal texts in which landowners complain about the flattening of their crops by herds of wandering apatosaurs? There aren’t any, for a very good reason: the brass shows a mixture of real and fantastical animals. Look at any medieval manuscript and its marginalia. You’ll see real animals and fantasy animals. You’ll see rabbits hunting humans. For goodness sake, allow people in the past to have imaginations! As the link says, “Judge for yourselves” (1 Corinthians 10:15). Please explain me how you do radiocarbon dates on ceramics ? If inconclusive results point to recent manufacture, there should be some sort of citation for such information beyond a link to a laughably written Penn State page that also fails to properly cite important references. For Pete’s sake, at the end of the article they claim that comic books inspired the 1944/45 discovery, then post a 1947 comic. I’d love to see some real info on this. I don’t know why you think the document from Penn State is “laughably written”; might it be that it fails to support your point of view? eloquently spoken, yet I don’t think you realize that your point of view on earth history is exactly why you will dismiss contrary evidence staring you in the face. you will always have a ‘rescuing device’ when faced with evidence contrary to what you BELIEVE. It’s a very common occurence in the “intelligent scientific community”. For an example from astronomy, just google Oort Cloud, and research why it was concocted. What puzzles me about the Acambaro artifacts is that they continued to be found under the foundation of old houses, embedded in ancient walls and the surrounding areas long after Julsrud and Mexicans of that era were dead. The motives for salting tens of thousands of these artifacts all around the Guadajanto region is particularly puzzling, with no prospects of ever realizing profit. The whole orthodox effort (believed to be spearheaded by the Smithsonian, the world’s alleged authority on ancient artifacts and genuine archaeology) to disavow these objects as genuine, despite admissions that they are legitimately discovered by archaeologists, causes me to wonder more about the motives of the Smithsonian, not resourceful Mexican craftsmen. Correction: I meant “Guanajuato”, not Guadajanto. If dinosaurs walked with man, why is there only vague disciptions and little said in Genesis? Calling out only one land bearing and comparing to an ox.. hardly description for a t-rex One would think that man would have been fighting for his life and been proud of the bravery and abundant food source? Not really much there considering there were over 300 types including flying with wingspans compared to small planes. Others a couple hundred feet long. Please elaborate for me. Don’t you think all of the profits would have more to say about that? seems a bit hard to believe that they did not. I posted the above a month ago. Why no replys from religious folks out there? Just because the Bible does not mention them as much as you would like it to doesn’t mean that it isn’t true. However The Bible does mention dinosaurs. Job 40: 15-24 talks about a creature named Behemoth. It’s characteristics would match quite nicely with what we would refer to as a diplodocus. Behemoth is rather more like to be a hippopotamus, as it lurks beneath lotuses. We know that sauropod dinosaurs were not swamp dwellers: rather they were grazers that wandered the plains. I also concluded that the word “behemoth” means “hippo” since it is the largest land animal which the authors likely could have known about. In the Bible, in Job 40:15–24, God describes to Job (who lived after the Flood) a great beast with which Job was familiar. This great animal, called “behemoth,” is described as “the chief of the ways of God,” perhaps the biggest land animal God had created. Impressively, he moved his tail like a cedar tree! Although some Bible commentaries say this may have been an elephant or hippopotamus, the description actually fits that of a dinosaur like Brachiosaurus. Elephants and hippos certainly do not have tails like cedar trees! Actually, very few animals are singled out in the Bible for such a detailed description. Contrary to what many may think, what we know now as dinosaurs get more mention in the Scriptures than most animals! So dinosaurs—all the different kinds—must have lived alongside of people after the Flood. If you look at many ancient structures around the world, many of them depict dinosaurs. Of course these will be dismissed for not fitting into science dogma or will be said not to actually appear what they appear as, or finally said to be depictions of mythical spirits. Many human artifacts have been found by miners in supposedly 100 million year old coal beds too. I remember the Russian find of only a few years ago. How do solid objects pass through layers of solid rock? I doubt that the Russian find had Christian motivation. So if you dare, search “Artifacts in Coal”. There just aren’t any credible examples. The Russian objects (tiny spiral, metallic structures) were natural formations. Most reports of objects from coal are nineteenth-century in date and, when they aren’t hoaxes, they are misidentifications. Why has no geologist in recent years reported such discoveries under controlled conditions, do you think? I’d have to correct the Job reference in the Bible. It says the behemoth has a tail like a cedar. Tell me any animal we know of that has a tail like that? It’s been passed off as a hippo most times, but have you looked at the tail of a hippo? Read the whole context and you can draw your own conclusion. I would tend to think the author is describing some sort of dino. If the author of Job is describing a dinosaur, where is the contemporary evidence (outside this text) for the co-existence of exile period Jews and dinosaurs (as in unfossilised dinosaur bones from an archaeological context)? Mr Fitzpatrick-Matthews, have you heard of the partially UNFOSSILIZED tyrannosaurus rex bones found in Montana? They took a thin slice out of the bone and found red blood cells in it. Red blood cells! How can that be if they are 65 million years old? Confuciuss’ bones are dust after only 3000 years. Fossilization happens faster than secular scientists would have you believe. You should see all the petrified human objects that are less than150 years old, a hat, a teddy bear, a piece of a clock was found embedded in stone, a lamp, even bags of flour. Now many fossils are examined for preserved cells at the time of excavation (before significant exposure to our modern atmosphere) and up to half actually contain them. Yes even modern science is often prone to the influence of assumptions. Take the recent discovery of extremophiles. We assumed microorganisms couldnt live in ice or boiling water or space, until we decided to actually check. If the carbon tests are showing age of 6,500, 4,500 years or so, there is still no connection between humans and dinos. All of that is manipulation that I canot explain, as well as I’m unable to explain acts of today’s illusionists.